There’s a difference between stenography and reporting. Stenographers record conversations for record keeping purposes. They do not ask questions or provide context while transcribing official proceedings like court testimony and legal depositions. Journalists, on the other hand, do not take official statements at face value. Rather, they interrogate claims, raise questions, and offer background information on the issues and events they cover. I was reminded of this distinction while reading two stories published in the Nov. 6 edition of The DePauw. The first addresses the Board of Trustees’ decision to approve a 2.9 percent tuition increase for 2020. The second offered an update on the Administration’s Alcohol Initiative. These are both newsworthy items. But the reports read more like the work of “stenographers of power,” to borrow Noam Chomsky’s useful phrase, than anything resembling journalism in the public interest. 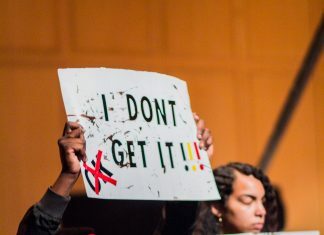 For instance, the story about the tuition increase features lengthy exposition from two campus administrators, President Mark McCoy and VP for Finance and Administration, Bob Leonard, without interrogating any of the claims they make in support of the tuition hike. In the context of the university’s wholesale adoption of economic austerity measures – most notably staff reductions and an increased reliance on part-time and contingent faculty – The DePauw offers a one-sided account of the need for, let alone the wisdom of, increasing tuition in a competitive higher education market. The report about the Alcohol Initiative suffers the same shortcomings. Noting a contradiction between the Administration’s claims of a reduction in high risk drinking on campus and the 2017 Clery Report that identifies an increase in the number of liquor law violations, the bulk of the story uncritically repeats Administration talking points. Both stories accurately present the Administration’s perspective. However, absent different and perhaps competing perspectives, the news stories reveal a worrisome official source bias in campus reporting. The Administration has at its disposal a variety of communication channels to get their message out free from analysis or critique. The student press should not be one of them.